We just can not make it any quicker or easier! Place your order today and we will manufacture your hottub cover, then deliver it directly to you, in about two weeks. Note: free delivery does not include Alaska, Hawaii, Puerto Rico or anywhere outside the continental 48 states. The typical time to manufacture your custom spa cover is about seven business days, not counting holidays. Our manufacturing facility is right here in the good old United States – in Florida to be exact. Many of our competitors sell products that are not made in the U.S.A. We take pride in the longstanding relationship we have with our manufacturer, the production team, and our shipping carrier. Without their help, we can keep costs low for you, the customer. Your spa cover will arrive in a box that is eight feet by four feet by one foot at least and multiple boxes this size for the larger covers. A typical spa lid will weigh around 45 pounds, but it is the box size that prevents us from being able to use UPS or FedEx to deliver to you. They will not accept any item this size. It is simply too large and bulky for their delivery trucks. Because of that, your spa cover will most likely arrive in an 18 wheeler or semi-trailer truck. 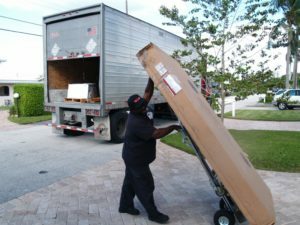 We ship with nearly all the large common carriers – AAA Cooper, Estes Express, FedEx Freight, R+L, Southeastern, UPS Freight (Overnite), Wilson Freight and Yellow to name a few. We will email the tracking information to you when your cover ships, so you can track it along the way. Once your cover reaches the freight terminal nearest you, they will phone you to schedule a delivery window. If they are delivering to a residence, they will not attempt delivery without setting an appointment first. The transit time for your cover from Tampa Bay will depend largely on the destination address. If your address is considered rural by the freight carrier, they sometimes will hire a local delivery company to deliver from the terminal to your address. The freight companies do not typically deliver on weekends or holidays and local delivery companies may not make deliveries every day to your address. Do not schedule to be home based solely on the tracking information found online. Until your appointment is scheduled, the online information is simply an estimate.